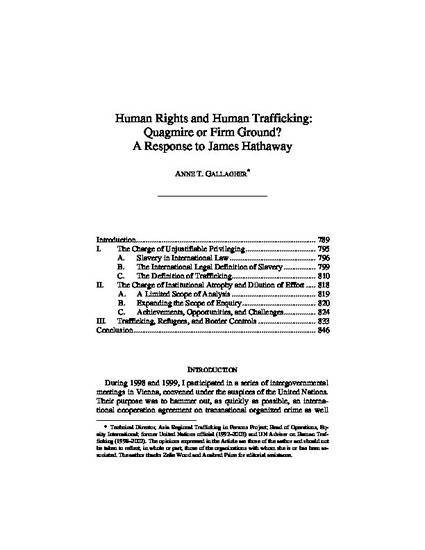 In a Fall 2008 article published in the Virginia Journal of International Law, James Hathaway questions whether the elimination of trafficking is a worthy objective and an appropriate focus for international law. Specifically he charges that while the elimination of trafficking is billed as the answer to contemporary slavery, the focus on trafficking has unfairly 'privileged' a small group of exploited individuals and diluted efforts that could have been better spent addressing the much broader problem of human enslavement. Hathaway also asserts that those human rights advocates and practitioners engaged on the issue of trafficking have been hoodwinked by preferred destination countries into supporting a covert extension and tightening of border controls, thereby driving migratory demand into the black market and increasing the difficulties faced by refugees seeking to access their right to protection under international law. This Article, written from the perspective of one who has been closely involved in the development of the new legal framework, as well as in its implementation at the national level in over forty countries, provides an alternative and a sharply differing perspective on the global battle to combat trafficking. In considering each of Hathaway’s major concerns in turn, and discrediting the assumptions and authorities on which they are based, I identify a number of serious flaws in both interpretation and application. In terms of the broader legal and political context, I conclude that far from damaging human rights, the issue of trafficking provides unprecedented opportunities for the renewal and growth of a legal system that, until recently, has offered only platitudes and the illusion of legal protection to the millions of individuals whose life and labor is exploited for private profit.